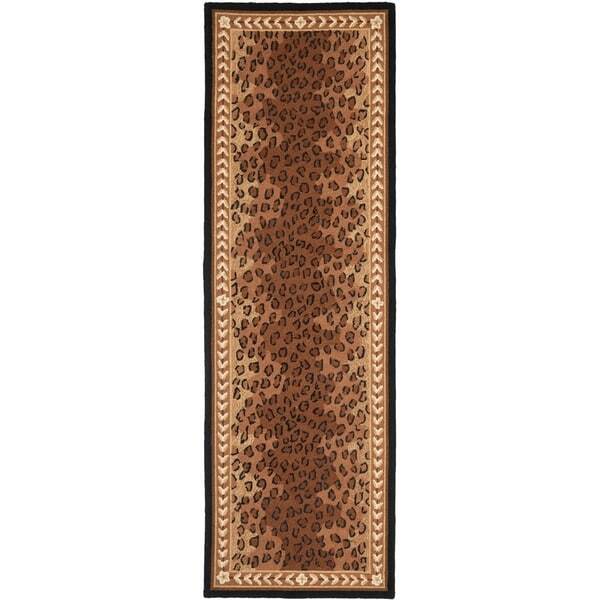 Safavieh Hand-hooked Chelsea Leopard Brown Wool Rug - 2'9" x 4'9"
Safavieh Hand-hooked Chelsea Leopard Brown Wool Rug - 3'9" x 5'9"
This hand-hooked contemporary design features timeless looks from a pure virgin wool pile providing comfort and softness to the touch made from an all-natural material. This rug displays a brown background with stunning accent of black, brown, beige and ivory spread across the beautiful patterns of this rug. Hand-surged binding and 100 percent cotton canvas backing adds to the durability of your rug to be enjoyed for many years. The fringeless borders give a very clean, elegant look and feel. Please keep in mind that new wool rugs may initially shed and have a natural capacity to shed for several months after purchase. This is normal due to the nature of construction of most wool rugs and not a defect. Click here to view our Wool Rug Care Guide. Dimensions 2 ft. 6 in. x 10 ft.
Great change. Doesn't go with any of my decor but a great bit of the unexpected. Nice in my neutral hallway. Good quality. Some shedding and I'm still trying to get it to totally lay flat but otherwise ok. I would recommend. Quality and color are great. Pleasantly surprised when I unwrapped the packaging. Very happy with the color and quality, I purchased the runner for my laundry room. So glad to find the size I needed for my Foyer.....looked for weeks before finding the right size. The color was a bit different than it showed on my computer but still worked wonderfully well with my colors. The color is a bit more bronze background than brown/beige which brightens it up some........would highly recommend. I needed something patterned and somewhat dark for a very trafficked hallway. This rug hit the spot! It is looped which gives an even more quality look to it. Colors are perfect for offsetting my cherry wood floors. I spent days figuri go out the right pattern and as usual, found it at Overstock. this was the third rug in this design that I purchased. Was expecting a more plush rug, which is what I didn't want due to high traffic areas. I almost bought these from a online Canadian company for twice the price. So far I have loved Overstock for prices (even tho I pay more in Canada), as well as selection. Shipping was excellent. I hope no one else finds Overstock in Canada as i continue to receive great products at an excellent price. This rug met my expectations. It is nice and thick, yet soft to walk upon and has vibrant colors as depicted. It's a fun addition to our mountain home! I bought 2 to place in the hallway perpendicular to our entryway. This rug is exactly as pictured and perfect in my hall. It’s nice thick feel, doesn’t shed and looks like it was quite expensive ! Purchased for a hallway between bedroom and bathroom for purpose of reducing noise and it not only does the job, but looks beautiful. Buy it, you will love it. Bought for hallway...have used before! Great classic... I am a devout Overstock shopper. I buy regularly and am almost always pleasantly surprised. Their customer service is excellent. As a design professional, I use OS regularly for my projects with confidence. Love the selection! Very nice and heavy rug. The colors are exactly as shown and makes a great addition to our bedroom. Leopard print in my laundry room ... do you think anyone will notice. Great quality rug. The quality of the rug was much nicer than expected. The colors balanced really well with the rest of our decor; lots of compliments. Great product for the price! Very rich colors! Love it. already have four others in the collection. 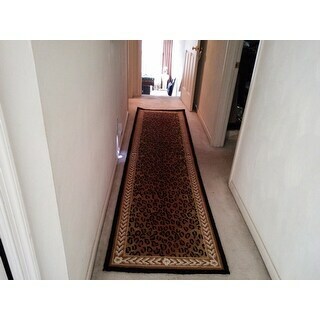 They make great entrance runners and protect the carpet from wear and tear at the rooms most frequented in the home. Have previously ordered and I am quite please with my purchases. Everyone I know, recommends purchasing from Overstock.